Here, we are going to learn about the fwrite() function of library header stdio.h in C language with its syntax, example. 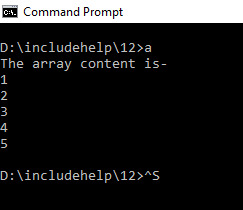 In the file handling, through the fwrite() function we write count number of objects of size length to the input stream filename from the array named as buffer. Its returns the number of objects that it will write to the file. If fewer number of objects will be written or EOF is encountered then it will throw an error.